The Killington ART Garage recently opened its doors on Killington Road, next to Wally’s American Grill, and hopes to be in full operation soon after Christmas. ART Garage owner Traci Templeton started the ART Garage as a summer ART Day Camp at her home on Upper Michigan road in Pittsfield in 2012. Templeton has now created a space where the community can come to create their own artwork. The Killington ART Garage offers daily drop-in studio hours where folks can explore their creative side. The ART Garage provides a variety of new and used materials, along with items repurposed, salvaged, sought and found. Templeton always has a variety of ideas on hand for those that need inspiration or can help participants find items to make their own imagination come alive. The business offers a retail section, run by Heather Turnbull owner of PURE.original on Center St. in Rutland, where customers can purchase original hand-made home décor and accessories. 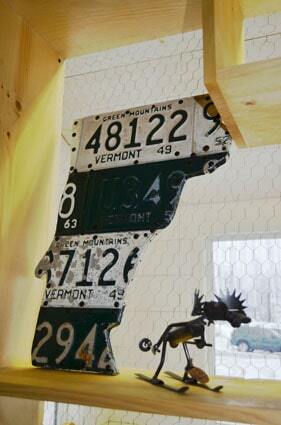 Both areas of the Killington ART Garage are great examples of “creative re-use,” giving items new value and life. Along with daily drop-in hours, Templeton plans to offer weekly workshops for adults, kids and groups. The Garage is available for custom birthday parties or special events. One programs to be offered is the Apres Ski Kids Creative Club, which will run on Saturdays and holiday weeks. Kids age 8-12 year olds are encouraged to attend a two-hour session of hands-on art and activities. The Kid’s Club will offer salad, pizza and cider. Two time slots will be available, the first starting at 4 p.m. and the second at 6:30 p.m. Reservations are required. Appropriately, Templeton and Turnbull used re-purposed and up-cycled materials in the remodeling of the space and are thrilled to embark on the new endeavor. The Killington ART Garage will be open regularly Thursday – Monday and everyday over holiday weeks. For more info call 422-8844.